Cannot speak for all denominations, but Catholics believe the Church is the "bride of Christ." And we believe that it is God's Church. I don't know about others, but I am really offended when people attack the Church. I'm not 100% on what you mean by "making light of." Think Monty Python. Or perhaps Father Guido Sarducci. In 1776, Representatives of the original thirteen colonies assembled and wrote the Declaration of Independence. With this document, our founding fathers proclaimed to the world that America was a democratic republic: "We hold these truths to be self evident, that all men are created equal, that they are endowed by their Creator with certain unalienable Rights, that among these are Life, Liberty and the pursuit of Happiness." When I first Googled "Can your eyes really go blind if you sit to close to the TV" I really believed that for the majority of the my life. I had no other view on it other then my parents. We have vasts amounts of information, at our fingertips 24/7, Millenials and Gen X aren't given the same "scare tactics"
May well be the best post I've ever read. I'm very tempted to plagiarize it for no other reason than I can't see myself, outside of BGP, giving credit to someone named Doubledeuce. The reason folks are walking away from religion in America is because religion is dead. There is no life in it. In fact, I would say it is a step in the right direction to give up on a religious, dead church, and walk away from it. If a church has turned into nothing but a self help, self righteous, self centered institution, then it offers nothing more than any other religion around the world offers. Pick your flavor and let it be about your self, your good effort, your rule keeping, and you trying to do whatever your religion says do. When this happens, it is no surprise that people eventually become disillusioned, from leadership on down. They become disillusioned because quite frankly, what they are being dealt in a religious, self help message, has no power, no hope and no life. It wears you out. On the other hand, when someone has a heart felt encounter with the love of God through Jesus Christ, this is not religion. It is a heart change. It is a miracle. It is an indwelling of God's spirit. It is being filled with the love and peace of God. You are a new creation by virtue of a new Person taking up residency in your Spirit. You now have a relationship...and a new "want to" in your heart. It is no longer a dead obligation to keep or a set of religious rules to follow. When this happens, there is NO walking away. In fact, you can't even in the face of being misunderstood, or even persecuted. It is not always easy to see, but there is a enormous difference between the hopelessness of keeping a religion and the miracle of Christ keeping you (Christ in you). One will always lead to disillusionment, the other will always lead to life! Simple...people are more self centered today than ever before, and many think of themselves as the "center" of everything that is and they don't believe or don't want to believe that there is a far greater being (God) who ultimately is in charge and has the final say. Yes, there is more that plays into it, but when you boil it all down I truly believe this. It also takes work to be a good Christian. God/Jesus calls us to act and abide by a set of standards. To be a good agnostic/atheist...well...you don't have to do anything. Many just don't want to work at it the way God asks. 1 thes 5:1 But of the times and the seasons, brethren, ye have no need that I write unto you. Take heed that no man deceive you. For many shall come in My Name saying, I am Christ; and shall deceive many. And ye shall hear of wars and rumors of wars; see that ye be not troubled: for all these things must come to pass, but the end is not yet. For nation shall rise against nation and kingdom against kingdom: and there shall be famines, and pestilences, and earth quakes in divers places. All these are the beginning of sorrows. Then shall they deliver you up to be afflicted, and shall kill you: and ye shall be hated of all nations for My name's sake. And then shall many be offended, and shall betray one another, and shall hate one another. And many false prophets shall rise, and shall deceive many. And because iniquity shall abound, the love of many shall wax cold. But he that endure unto the end, the same shall be saved (Matthew 24:4-13). So, because the church appears to be in decline in America, it must be in decline in the whole world? Is that what I am seeing in this discussion? Since when did the US reflect the only part of God's Church? Pastor and church planter Ed Stetzer, however, argues that the church isn't dying at all, but that it's going through a kind of shakeout, or, to stay with the agricultural theme of the parable, a winnowing, although he doesn't use that word. Stetzer separates the 75 percent of Americans who call themselves Christians into three categories: cultural, congregational and convictional. He defines cultural Christians as people who are Christians simply because their culture tells them they are. But they're Christian in name only, and are not practicing a vibrant faith. Congregational Christians, says Stetzer, are similar to cultural Christians, except that they have some connection to actual congregational life, a church they attend at least occasionally. Convictional Christians, on the other hand, are those who actually live according to their faith. They are the people who would say that they have met Jesus, that he has changed their lives, and that their lives are centered around their faith in him. Stetzer acknowledges that the number of Americans who now identity themselves as having no religion -- the "Nones" -- is growing, but he suggests the change is coming from defections from the cultural and congregational Christian categories, because there's now less societal pressure to be "Christian." These folks "feel comfortable freeing themselves from a label that was not true of them in the first place," Stetzer says, but he quickly adds that convictional Christians are not leaving the faith. Here's Stetzer's conclusion: "Christianity may be losing its top-down political and cultural influence, but Jesus spoke of his followers making an impact in a very different manner. He taught that God's kingdom was subversive and underground [like the seed secretly growing!]. He used examples like yeast, which changes things from the inside, and mustard seeds, which are small and must be planted in order to grow up and out." I read Stetzer's stuff, and while I think he might be on to something, it also kind of just seems like damage control. A decline in numbers is a decline in numbers, you can paint is as bad or healthy. That's purely opinion. But the less people you have at something is always damaging, and there isn't a way to spin that positively other than what he did. He could very well be 100% correct and I wouldn't be surprised if he is. I know plenty of people who claim to be Christian whom I'm not sure I have ever known of them to actually practice their faith other than a Facebook share. He took the only way to try and make it positive and did that. It's like having a football team and kicking off a lot of really uncommitted kids who do more harm than good. The church could very well be at a make-or-break moment for their future. I don't think so, I believe in the Philippines it is strong and prominent as ever. I don't know what the 70's, 80's, and 90's were like, but it is absolutely eye opening to see how many young people (college-aged) have left or intentionally reject the Church. I have theories as to why, but those are for another thread. But I don't know. Maybe in the 70's, 80's, and 90's, college-aged kids were against the Church back then and either A)they rejoined the Church or B) that's just the way it is; Christians are just becoming a minority (in this context). IMO. The points I take well from Setzer are what I've said all along. The shift is the number of Societal Christians choosing to stop identifying themselves as such because of culture. The Church has long had a problem with people who claimed faith in Christ but were never committed to exemplifying the love of Christ or follow through with their lives. From Annania & Sappora to the Church leaders who refused integration and civil rights for other ethnicities; the church has long had a problem in this arena. The 60's and 70's saw the emergence of the "Jesus Movement." That was much more para church than church and many surmised the end of "organized religion" in the future. Of course that was nearly 50 years ago and I don't think anything you see today is a response to that movement. If anything the 50's were an anomaly in church activity and growth in America. In some way or another the "numbers" (not always accurate IMO) have never approached that era. There are many factors for this but the "Church" has grown in many parts of the world (Middle East, Africa, SE Asia) despite the persecutions there. 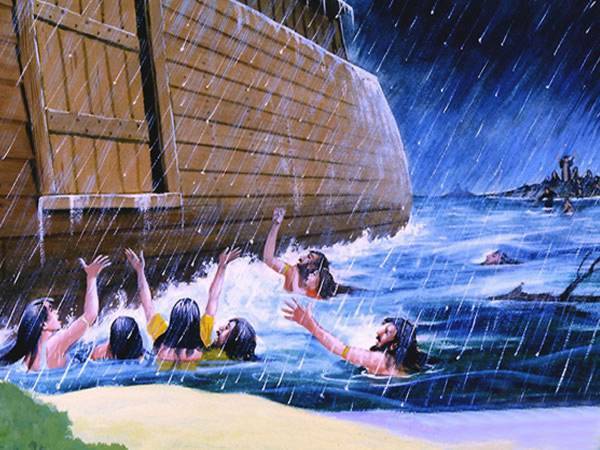 Noah didn't do so bad with only his family and animals on board. I shouldn't have chuckled at that. Should I?